Dr. Sanjit Kumar Mitra was born November 26, 1935 in India, where he received his elementary and secondary education. He graduated with his Bachelor of Science degree in Physics from Utkal University in 1953. He then proceeded to the University of Calcutta, where he received his Master of Science degree in Radio Physics and Electronics in 1956. Moving to California to pursue more graduate work in computer engineering, Mitra earned a second master’s degree and a Ph.D. in Electrical Engineering from the University of California at Berkeley. He then spent brief periods of time working at Bell Labs before devoting himself to his present fruitful academic career. 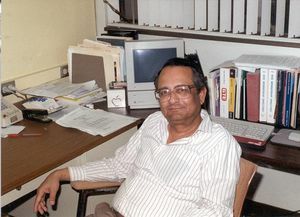 Mitra was an EE professor at Cornell University from 1962 to 1965, and then with the University of California, Davis before moving to his present career position at the University of California, Santa Barbara. Mitra became a full professor in 1971, and the chairman of UCSB's Department of Electrical and Computer Engineering. His work focuses on filter design and digital signal processing for computer networks. Mitra has written a dozen book chapters and has written or co-written more than 400 journal and conference papers and twelve books. He holds several patents, and has lectured and researched internationally. Mitra is a member of the IEEE and has served as the Circuits and Systems Society's President. The interview spans Mitra's pathbreaking career, focusing on his years as an academic. Mitra discusses his collegiate and graduate education in electrical engineering and praises his mentors Ernest Kuh and Charles Desoer. He describes the influence of his time at Bell Labs and of his experience adapting Sidney Darlington's lectures for publication. Mitra explains much of his work with computer filter design and his contributions to the signal-processing field, describing many of his research collaborations and international visiting appointments. He mentions pioneers in signal processing, including some of his former students and academic collaborators. The interview also covers the evolution of the University of California, Santa Barbara's computer engineering program. Mitra evaluates the IEEE and speculates on how it might be improved. The interview concludes with Mitra's opinions on the need for more IEEE continuing education work and for updated university curricula. Related interviews on the history of digital signal processing include Anthony Constantinides Oral History, Alfred Fettweis Oral History, and James Kaiser Oral History. Interview #237 for the Center for the History of Electrical Engineering, The Institute of Electrical and Electronics Engineers, Inc.
Sanjit Mitra, an oral history conducted in 1995 by Frederik Nebeker, IEEE History Center, Hoboken, NJ, USA. This is the 22nd of February 1995. I am talking with Sanjit Mitra in his office at the University of California at Santa Barbara. This is Rik Nebeker. Let's see. You were born the 26th of November 1935 in Calcutta? What was your family background? My father was a lawyer. And were you educated there in Calcutta? I was educated in Orissa, which is a neighboring state. Bengal, and Orissa are neighboring states. But we are originally from Calcutta, and my grandfather moved to Orissa, and practiced there. And my father practiced there, as a lawyer. But most of the family, I would say a majority, were educated in Calcutta, because we are Bengalis and Orissa has a different language. We went to school there, but our higher education was back in Calcutta. I see. And did you decide at an early age that you wanted to go into science and engineering? Well, in India, this is something -- most jobs are in engineering or in medicine. And unlike here, the number of openings in Indian schools of medicine is very limited. So like most Indians, we applied to every school. So wherever we get in, we go. But in my case, there was a different story. My brother influenced me. He talked me into going into electronics, which was a new program. Calcutta University. Most engineering, electrical engineering, was power engineering, which was not my real interest. Actually, I was more interested in being a doctor, because there were several doctors in my family. Relatives. But my brother thought electronics was new, so job prospects would be better. I see. Were you interested in amateur radio at all? No. Not at that time. Because I had a bachelor's degree in physics, not engineering. And because of my brother I went to electronics. After studying, I realized it was at a very primitive stage, and I pretty much made up my mind to come to the United States. It was one of the earliest programs in electronics. In most Indian universities, when they started this program, it was part of a physics department. Except in Calcutta University, where there was a separate department set up, by one of the pioneers in upper atmosphere who also had the same name as me -- S. K. Mitra. He definitely was one of the pioneers in bringing electronics education to India. So it became a separate department. And it was the only program which was a three-year degree program, rather than a two-year master’s, which it was elsewhere. So that's a longer program, then. Basically, after a bachelor’s degree, it's five years. Most engineering degrees took four years. So we got a masters degree at that time. Who were the most influential teachers for you at that level? There, we really didn't have very many good teachers. Most of them were pretty much self-taught in electronics; they had physics Ph.D.'s. And we were taught a lot by graduate students. There was one professor who definitely influenced me because of other reasons. But the main thing I liked about the subject was that it was new, there were more prospects, and the other thing that happened to me -- In Indian education, particularly engineering, in our program, we have to go into industry for four to six months before we get our degree. That's mandatory. And I managed to get a job at the Indian Statistical Institute, because my uncle was a statistician, my brother was a statistician, and they both worked there. The first computer came to India at Indian Statistical Institute. So I was very fortunate to get into computer maintenance, when I knew nothing about computers. We had to learn from scratch. So that was your job there, to maintain the computers. That was my job. Essentially on the job we learned how to maintain the computer. But that computer is now not even a PC. Was it a commercial computer, an IBM? No, it was a British, Hollerith machine. It had 1K drum memory. And we had to program in machine language. It was fascinating to me, because we had pretty much the freedom to do what we wanted, and I started programming because I started playing games. I was not a programmer; we had professional programmers, and then I started learning from them how to program, so I wrote a lot of games. And so my supervisor was very impressed. Looking back trivial things, I wrote tic-tac-toe, which the machine never lost. He thought it was a great program! But in those days, those were used to impress visitors, you know, that the machine can think. So I wrote a lot of computer programs to play games. But, again, these were pretty much learning on the job. I really got fascinated to learn about computers here, in this country. So you worked - is this right - two years at the Indian Statistical Institute? Two years. After our training, we were hired to become regular engineers. And you said you decided that you wanted to come to this country to get more training in electronics? Well, to get a Ph.D., basically, to get higher education. Indians, in the early days, you know, were going to England -- Oxford, Cambridge. But once I started looking at the literature, I found that things were happening within America. Plus, my brother came to North Carolina to get his Ph.D., so there was another reason. I went to Berkeley, because I had an uncle who had spent a year there on a Fulbright, and he sold me on the weather. So when he found out I had an offer from Berkeley, he said, "Go to Berkeley!" And you got a master’s and a Ph.D.? I came to work in the computer area at Berkeley, and I found a basically one-person effort, and the person in charge was on sabbatical. And I took a course from Charlie Desoer. I don't know whether you've interviewed him. He made the biggest influence on me, and I got sold on circuits: very mathematical, everything precise, and so he asked me to do a masters under him. And then, the first two years I was a teaching assistant, then an associate, but I wanted to get a research assistantship so I could concentrate on research. So several professors offered me a research assistantship, and I went to work with Ernie Kuh, mainly because he gave me more money. And what was his area of research? Circuits. So, my Ph.D. was - I am one of the earliest researchers in active RC filters, which is the IEEE Press book I edited. And even with Charlie Desoer, my work was on the computer-aided design of circuits. And one of the early papers in that area, which is in the Director's book. But those days it was IBM 701 or 703 -- I don't remember the number. There was no FORTRAN or BASIC, and I had to write programs in machine language. It was batch processing. My master’s thesis was a huge deck of cards, and each card had one command. I had to punch them myself, but fortunately the computer center operator at Berkeley helped; we'd become very good friends. And he let me come in the evenings, so the machine was mine. You had to do a lot of computing. I had to do a lot of computing, but my kind of work, I needed to know the result and then to decide what to change. So normal batch processing -- that would take me a long time. But because of him, I was able to come in the evening, and he let me learn how to turn the machine on and off, and how to rotate tapes. So that really helped. That is one of the reasons I got out of computers, because it was taking such a long time. Sometimes, looking back, I wish I'd stayed, because I'm one of the first persons to work in that area. Yes, in computer-aided design. My Ph.D. was very theoretical because I decided to finish as early as possible, so a theoretical topic was much easier. Ernie Kuh. How was he as an advisor? Well, Desoer and Kuh are two different people, and they both impressed me. To Desoer I am grateful, because coming from India, I was not disciplined, I did not know how to do research. And Charlie used to come every evening to my office, "What have you done today?" I was scared in the beginning. I did not know how to do research. He said, "I don't care. You have to produce. You have to work." So eventually I got into the habit of working regularly, trying to budget my time so I'd know I had spent some time on research. And he had influenced me a lot in a personal way, also, one of the greatest friends I had. In Ernie's case, he said I could do whatever I wanted for my Ph.D.
Did you have a problem you wanted to work on already? Let me tell you -- in Charlie's case he told me what the problem is, and in fact, the masters thesis came out as a journal paper. He taught me how to write, which is something -- most students do not know how to write. I'm grateful to him for that. And Ernie left me alone, saying, "Do whatever you want, but once a week tell me what you have done." That made me independent. And he said, "You choose whatever topic you want to do research. Just come and tell me what you're doing." It took me a long time to stand on my feet and know how to create a problem. Fortunately, those days, journals were not too many. Another thing which helped me a lot was that many of the professors at Berkeley used to give me manuscripts for review. So I knew their findings before they were published. Yes, reviewing articles, which I thought was training for me. Sometimes it would take me a long time. I'd have to go to the library looking up a reference because I didn't know a lot of areas. I spent a lot of time trying to understand, and that really helped me, because I started reading a lot. And you hadn't done that much before? No, master’s students' work is pretty well defined. And that is something I tell my students, to try to read one or two papers every day, because sometimes, a few years later, suddenly you'll remember, "Oh, I remember seeing something. I can use it here." And this I think was a big help to me, getting into a manuscript before it was published, and forcing me to learn areas which I knew nothing about. After awhile, Mac was editor, and he started sending me papers to review, when I was still a graduate student. I hope they found my reviews useful. That's very interesting. A new element of graduate education. I do that to my students, because I think it's very important. How do you evaluate something you don't know anything about? And how was it for you, finding a thesis? Thesis - it took time, and the other person who helped me a lot was Bob Newcomb, who was a Ph.D. of Charlie Desoer and went to teach at Stanford. We were very good friends. I used to try to see him once a week, to talk about things. I did not know how to create a problem. Talk to Ernie, talk to Charlie -- at that time, of course, I didn't call them Ernie and Charlie. With the Indian background, I used to call them Professor Kuh and Professor Desoer. And "Sir." And Charlie just used to tease me about how it finally took me about ten, fifteen years before I had the guts to call him by his first name. Did you have any resentment that Ernie Kuh didn't have some good suggestions for Ph.D. projects? No, because a Ph.D. by the way has to be independent research. But very often, I imagine, professors will say, "Here's a good project." Yes, but in my case, I thought it was a golden opportunity. Ernie was known to be a very strict professor. I really benefited because I would do a lot of work, and then he'd say, "Oh, this is nothing." When I'd talk to him, I'd suddenly realize -- for a week, I thought I was doing great research, then I'd find, no, they'd found an easier way of doing things. So that is important, for a professor to validate the work, but for a Ph.D., if you tell them, "Do this, or this," that's not a Ph.D. The student must come up with it. That really helped me to stand on my own feet. Because one thing I used to do -- I don't do it as much now -- when I read the article, I immediately write what ideas I am getting out of it. What problems still have to be solved. A lot of my early papers were finding holes in people's work, redoing things, filling in patches, or doing some small work which I found people missed. I used to have a book, like that, to get my ideas going. I don't do that anymore. So now I tell the students, "If I get an idea, write it down, because I won't remember what I told you yesterday." Yes. Because I look at it -- ourselves, we're engineers, we're applied, we don't have to develop new theorem or new material. If I can take somebody's ideas, and apply them to something else, that to me is creative work. And the more you know, it's very useful. Because sometimes I'll find a paper I read ten years back. I roughly know which journal, which author. I can go and locate it, and then I'll say, "This result I can use." So the more you can collect this kind of information -- that's the way I would interpret it, doing research. I was particularly interested in what you said about finding a hole in the argument. A lot of times people make mistakes, and sometimes people really don't find it, and sometimes I'll find that their proof was incomplete. And that then leads to something. That leads to something new, yes. And that also builds the confidence, because I had lots of papers before I got my Ph.D. So this gives you confidence that you can stand on your own feet. Were there any books that meant a lot to you, in your education? The books at that time on networks, of course Guillemin was the father of network theory, network synthesis. There were not too many books. Sometimes people say, you know, "Terman's Radio Engineering was my bible," or that some book was very formative. Well, first of all, I am out of network long time back. But I think the influence I had was from Charlie's notes. He was a fantastic teacher. What about Guillemin, the book? Besides being almost the only one, was it a good presentation -- Guillemin? Guillemin was, yes, I would say, and definitely at that time, that was the leading book. I'm trying to remember, Tuttle had a book, but he was supposed to write a series of books. Tuttle from Stanford, but as far as I know it is only one book I have seen from him, which is on one-port. And Guillemin's Network Synthesis, I still have it. Another book which was not used, but I found a used copy, Bode's book -- I bought it, and sometimes I found that -- that has a fantastic wealth of information. What is the title of that book? Well, how did it go completing your Ph.D.? It went quite rapidly. It went very fast. I was very lucky. Once I defined the problem, and I did some partial work, then there was a paper written by Dan Youla and Herb Carlin in the Proceedings of the IEEE. It essentially was the area I was working in, but they did more than I was thinking, so I essentially went to ground zero when I saw the paper. But because of my reading so many articles, suddenly things clicked. I think I finished my work in less than six months. Things started happening so fast. And I wasn't planning, really; it just happened. Ernie was happy to let me out. And what was the thesis? The thesis was on active RC networks, and I think I still have my only copy somewhere. This was one of the early works -- I'll find it for you later. And then you took a job at Cornell? Before that, also, between my master’s and Ph.D.; suddenly Ernie came to me -- at that time I was not working with him, but I pretty much indicated that I would work with him -- to see whether I wanted to go to Bell Labs for a summer. So that was a very big influence on me. In fact, before I went, Sid Darlington came to Berkeley to give a series of talks, and Ernie suddenly got the idea that I should transcribe his lecture notes and distribute them the next day. You know, what is it, a mimeograph? Shorthand? Oh, a mimeograph machine. Yes. We didn't have any copying machines, so I had to write neatly on a mimeograph machine and make copies and give to everybody. And Sid Darlington, which was my other fortune to get to know very well -- to us he is a giant, and I hope he is interviewed. Well, I've talked with him on the phone, but I don't know if we have anyone who has interviewed him. Well, his impact is, again, immeasurable. It is unbelievable what he has done. Particularly network, in many areas. -- anecdotes, and things. I found it very difficult to follow his lectures. He used to jump from one topic to another topic, so I had to sit down with him later on, and say, "Tell me, what's this word missing? What did you say there?" But that helped, trying to understand more. Because he was talking about a lot of new things which had never been printed. Fortunately, after the last lecture, he left, and I got a job at Bell Labs, so I finished it there. That last set of notes. The last lecture note was done at Bell Labs. Then Sid Darlington brought it out as a technical memorandum. Oh, a Bell Labs memo. Then he gave credit to Ernie Kuh and his students. That was something -- it was worth doing it. There were lots of new ideas there which he'd never published before. Was that technical memorandum used? I believe so. I think, later, he published. But I wrote it! Well, that's interesting. You may know, Michael Faraday got his start taking the notes of Humphry Davy at the Royal Institution. Yes. Because of my work with Darlington, I used to have lunch with him, and could talk about the work -- he introduced me to a lot of people. I mean, at least I shook hands with Nyquist. And Selkunoff-- I remember meeting, I think, there. That was another place which I thought was unbelievable -- all the giants used to be there. You name it; they were there. So you worked a summer there? I worked one summer, with John Bangert in filter design. But I did pretty much, you know, exploratory research. I was very influenced by Bell Labs. What sort of application did you have in mind for the work you were doing? At that time, it was not quite application, John asked me to write a computer program, to do nonlinear network analysis, and it was something I'd not done before, write the program and made it work. So I asked him, "Where will this be used?" And he said, "Well, we don't know; someday it'll be useful. Don't worry." This is just very general? Very general. But I liked the atmosphere, and I already had a soft corner for Bell Labs. So when I left Cornell I went to Bell Labs, I didn't go anywhere else. So you worked three years at Cornell? And then went for a year and a half at Bell Labs. Yes. I wanted a little more industrial experience, and so I decided to go back. Even there, I wanted to work in a different area, because I knew I was going to get out of circuits. Well, I wanted to work in an area in which I knew little, so I could contribute and learn things. I was looking for people who did totally different things. And I picked one gentleman's group, because I found him to be very much like me, thinking, doing new things. Bob Aaron, have you interviewed him? Oh, he's a tremendous guy. I had finished my interview, I had told personnel which group I wanted to work with. Then I was visiting a friend of mine, Bharat Kinariwalla, he's now at Hawaii, but he was at Bell Labs and we were very good friends. Bob called me at his home, found out where I was, and for a couple of hours talked to me on the telephone about what he was doing. He said, "I'm sorry, I was on vacation, I couldn't get to see you, but I really want you to work in my group." And I was sold. So, after the telephone interview I went to work with Bob. And that was something, I think, a fantastic experience for me. I wanted to work at some industrial research because I did not know if I wanted to teach or work in a lab, say, like Bell Labs. So I wanted to try both of them, because one summer was not enough. I felt Bell was a good place to work; I really enjoyed it. But I wanted to make sure that it justified staying at the university. I wanted to see the other side. But is this in the same general area -- circuits? No, actually, the reason I picked Bob was for his analytical support group. Basically, people came to us with problems and we solved them. So I had exposure to a lot of different problems. The other nice thing about Bob Aaron's group was particularly Bob Aaron himself, whom I respect a lot. He used to get every technical memorandum in Bell Labs, in the distribution list. Then he'd pass them to us -- there were four of us working under him -- with some comments, and that led to quite more new research for me, because I found a better way of doing things. This had nothing to do with my usual work, but the problems were fascinating. That was something I found intellectually very satisfying. I wrote more papers in the year and half -- I got two patents -- than in my whole professional history. He provided that stimulation, and he provided ideas. And a lot of times people would come, and their problems were not that difficult, but they needed some analytical evaluations. So that was our job. These were people from outside Bell Labs? But one of the projects I was assigned to do -- it was, again, from a historical perspective, very interesting -- all these years I'd been working on active filter, and I'd never built one. So Bell Systems were going into PCM, and with PCM, before you sample, you need the anti-aliasing filter. They had an analog LC filter, with two precision inductors. So their cost, I was told, was two dollars, the inductors cost about a dollar apiece. Bob thought to see if I could do an active RC filter, and then it could be miniaturized in mass production. And I came up with an idea where I could duplicate, pretty much... There are a lot of theories behind the design, because it works from a switch; it's not a time-invariant circuit, but a time-varying component. Bob came up with the model, to represent the switch under some assumptions. So I was to find a way to duplicate that in an active filter. And 0709 op-amp or 701, I forget the names, the first op-amp which Fairchild produced, we bought two of them, for forty-five dollars apiece. We had it built and we showed that it works, so I had a ninety-dollar solution for a two-dollar problem. Bob said, "Okay, what else can you do?" But, you won't believe it: After I left, somebody else's design they are mass-producing it, because op-amp costs nothing! In fact their solution has three op-amps. It depends on technology. But at least we were able to show it can be done. This is something I always tell the students, how things can change, how everything is dependent, and in industry, cost is important. I think this kind of experience was very good for me. Again, going back, my heart was in California, so when I had an offer from Davis, I took it. Because I liked Berkeley, I liked California. For the first summer I did not have a grant, I went to work for Lenkurt Electric, which was part of General Telephone. I told them I wanted to do a real design problem. They gave me a problem for a filter design, and it had also a space limitation. Not just meeting the specs, but it had to fit a certain part of the chassis. And this was a new experience for you. I wanted that. I really wanted to work something, because Bell Labs was totally research, but this was a real practical problem. I don't remember who the customer was; they had a product and this customer wanted some extra channel, frequency division multiplex. And I designed it using their software. Ideally it worked -- but when I put tolerance, one place it didn't meet. So I talked to my supervisor. I said, "Look, I've done everything in the books you have. Either I need one more component or change the spec. This is one place I need half a dB more." I'm not joking; I said, "I need extra half a dB, because when I put practical components, did a Monte Carlo analysis, it's not meeting at that place." So he said, "Talk to the system designer." So I went to the system designer, and said, "This is my problem." And he said, "Give me two days." Two days later, he said, "Okay, you've got your half a dB." To me that was very profound. I say to my students, "Look, you have to know how to work with others, but if you don't think there is an answer, you have to find out whether the problem can be changed." And this is something we cannot teach. If it would check out. If there's half a dB, whether someone else could give him that. I don't know the whole system. He needed some time because he gave out the systems spec, and everybody had to follow, and he had to see how he could manage. To me this was very profound. I said, "Look, you learn things in books, but you don't know the other aspects that you have to work with. You cannot say, ‘this is it’." Okay, that was 1967 you worked there. I see that was the summer after you started at Davis. I came in January, so within six months, and I didn't have a grant. How was it at Davis? How did you like the university? Davis -- a lot of this I don't usually talk about, but anyway... Davis is part of the University of California -- it has a lot of strength. But what I found there -- there was no plan. Things were sort of going along, and faculty being hired pretty much one in each area, so there were no areas of strength. I wanted to see some concentration in a few areas where we could really compete with some big schools and make a mark. Have you been the sort of person who typically works with others in research? Yes, in some senses, but again, to make an impact, sometimes you have to talk to another person -- not a student -- and Davis was sort of spread out thin in a very broad area. I like to have a plan, where I'm going, what I'm doing, not just doing things every day before worrying about the next day. I'd been to UC-Santa Barbara before. I had some very good friends there, most of who are now retired. So I had a phone call from a professor here at Santa Barbara asking if I wanted to move. So I said, "Well, I was not thinking about it." So I drove down, and talked to the chair at that time, and I found he thought exactly the way I was thinking. The department is going to be in four areas, and that's it. Everything is concentrated in those four areas. And one area happened to be mine. Well, this department is basically four groups. Solid-state, computer engineering, wave electronics and technology, and signal and systems, which is now called control, communication, signal processing. Most of the faculty we try to hire are in these areas. At least we have now been able to get some name for the department. What direction did your research take? At Davis, again, I had an NSF grant on active filter for a number of years, but I was actually getting tired of working in that field. Then one summer I terminated my NSF grant. I told them I wanted to change fields. I started talking to some industries; I said I needed to do something totally different that summer, not network. So I got an offer at Stanford Linear Accelerator Center. To model test equipment they had built. 1970 or 1971, it should be there. Stanford Linear Accelerator Center. You were there on two occasions, the summer of 1969 and then the summer of 1972. 1969 is the one when this happened. I was pretty much trying to get out and looking for other areas to get in. And so I went back to Davis and told the chair that I wanted to teach digital signal processing. He said, "Okay, go ahead." There were not too many books, and I was doing some early work, but I did not know much about the field. But fortunately, Jim Kaiser was at Bell Labs, and we were good friends. I used to send him my work, saying, "Can you help me?" And he helped me a lot. We were very good friends. So he really mentored me in this field, which to me was sort of self-taught. Were a lot of people getting into digital signal processing? Eventually, but at that time, not too many. And then I met Al Oppenheim, and he also gave me his lecture notes which were becoming a book -- the manuscript, which helped me. A lot of people have helped, Larry Rabiner, a place to send questions or comments. Did your background help you particularly? In some sense it did and in some sense it didn't. But it had influenced a lot of my research, because one of the advantages of circuits is that I can close my eyes and see how the waveforms are going. There were a lot of strong concepts in circuits, which helped me later on. And I like this tie-in -- to me, both are processing signals. So in my definition, a circuit is anything which takes a signal and picks the signal out. There's something to it, whether it's digital or analog. My latest interest, mixed analog-digital, has become a real hot field. I find, again, that having background in both areas helps me. A lot of work we have done here, is taking ideas from both and mixing it up. I think that was a good training. How were you guided in this? Where did the problems come from? Were you consulting? As I told you, because of my Berkeley training, I could find the way to tell the problems, and find what has not been done. So a lot of early work was basically taking things which were known in circuits. I'm not proud of this work, but at that time, I thought they were an interesting contribution. So Jim Kaiser helped me going through this, making sure that everything was working. What I'm wondering is, are these problems internally generated by the theory, or externally generated by people trying to do that? No, mostly internally generated. A lot of times you run into something, then you find the bottleneck, and then you solve it -- that's how you generate problems. A lot of work I currently do is suggested by companies, and they are theoretically interesting, that's why we do them. But also, the majority of work is reading something, getting ideas from it. Developing that field of digital signal processing. Right. I think that a lot of work in DSP has been essentially taking something of the analog concepts and redoing it for the digital. That has helped; that has helped a lot. Sometimes it hasn't, and sometimes it has. A good example I'll give you: there's another giant, Alfred Fettweis. He is now at Notre Dame, retired from Germany. He has done pioneering work in digital processing, but he is from an analog background but getting into digital. One of the work which people have worked on in analog is, how do you design active filters which are less sensitive to component changes? In an active domain, it can become unstable. In passive, there's no instability. So low-sensitive work has been big. And John Orchard -- he was at UCLA, he's retired, he was at Lenkurt at that time, I think -- showed that a certain class of analog filters by design are low sensitive. So a lot of work going on at that time by John and his group was to replace inductors with active inductors. Fettweis came up with a way how to take passive components and replace them with digital equivalent, so they keep that structural property. He called that wave digital filter. I was intrigued by that concept and a lot of times, now, we don't teach circuits in a lot of the graduate courses; we stopped because nobody wants to take it, and I don't have the time to teach it. I would say, "Today's students don't know that much about circuits. How do I redo Fettweis' theory purely in the discrete time-domain?" I had a brilliant student at that time, P.P. Vaidyanathan, a full professor at Cal Tech now. He came up with the idea of how you preserve passivity with digital filter structure. I found later that he did not know circuits, but what he had done already existed in circuits which people did not know the implications of. But he came up with the first synthesis method which was known in circuits, called the Brune synthesis. When I saw it, I said, "You have solved the whole problem. I know how to do the rest of it. I know how to do it." Several groups have come up with similar ideas, but coming from different directions. This is, I think, the advantage of knowing circuits, that coming with this fundamental concept, we are able to do other things where there is no counterpart to circuits. Because in digital field there is a class of filters called finite impulse response, FIR, filters. Which are polynomials. So there's no polynomial-like thing in the analog domain. We are able to find the low-sensitive structure of those filters based on this concept, the fundamental theory. Let me tell you, the way I find the whole research process, I listen to people. I go to as many conferences as possible, I listen, and I get ideas. I'm not copying their ideas, but I find I can use some. A good example: Jim Kaiser came here several years ago, and talked about a nonlinear filter he has developed. I immediately saw its applications in image processing. That started a whole series of works, now, for us, on the Volterra series, Volterra filters. We are finished, and I finally understand how to design filters, because non-linears are very difficult to handle. There's no frequency response; we cannot pursue the ideas which would work. And that's how we got into it -- it was pure accident. A lot of things can happen because something tells you... If I read a paper which excites me, how come I didn't do it? And I say, "How did this fellow come to this idea? It's clever." I try to put myself in his or her position. There must be a way that generated this idea to that person. I really want to see some of the giants sitting down and explaining how they got that idea. Some may be purely inspired out of nowhere, but with other things there must be something triggering them to think of that problem. And it happens, many times, when I wonder, "I read it; I could have done this. Why didn't I think of it?" And also, in listening to someone or reading something, you do get new ideas. And it happens in this field, where many of us come with the same idea at the same time. I have a very good friend in England, Tony Constantinides and he has told me many times, I have beaten him, because I was a few months ahead of him. It just happens; suddenly I see things, and he saw it too. This is something students don't realize: if you don't work fast enough, somebody else is going to do it. It's not that they're copying it, but we all read the same journals, we go to the same conferences. For us, time is very important. Now, is this the case, of a realm of theory -- this digital signal processing -- that was really being explored for the first time in this period? Yes. Its history is sampled-data control; in fact, Eli Jury is another pioneer; I don't know whether you have him in mind. Eli was a professor at Berkeley. I used to know almost every professor at Berkeley on a social level, and that was one of the problems, because I was spending more time drinking coffee than doing research. Eli was essentially a sampled-data control person, and I was a circuit person. Then one year he sent me a letter from Rome, he was on sabbatical, and he said, "Sanjit, we both are working on digital signal processing; we are so close to each other. Why don't we work together?" So for a long time I used to go one day a week to Berkeley, to talk to him and to his students. He had a lot of very bright students, who did a lot of work based on my suggestions. And it was really very profitable. And most of this development is, as you said before, internally driven. Internally. Well, sometimes it happens by listening to people. I try to read as much as possible, scan conferences, who is giving what papers, trying to get copies, if anything fascinates me. I write to them, "Can you send me a copy?" I have a habit of giving my students problems which are not related to their theses, if I know they can do them. I tell them, "Here is something I saw. I think you can do it better. Why don't you look at it?" Like Bob Aaron used to do. Because he got all reports and gave them to his people saying, "Think about it." Sometimes, you know, this method produces someone like P.P. Vaidyanathan, and in my opinion, someday he'll be a giant. He is already a giant to me! He got into multirate when I thought everything was done in multirate. And now he has shown, there's a lot more to it. He became a Fellow of IEEE eight years after his Ph.D., while still an associate professor. I nominated him, but I was questioning it. I talked to my friends, who said, "No, he deserves it," and I was very happy to see him become a Fellow. His contribution to this area is enormous. If you go through Transactions, you will find, typically, fifteen to twenty papers per year. When he was here, he wrote so many papers, I couldn't believe it. I had another student like that who went to Paris, he's teaching in Paris now. Phil Regalia. He was like that. With both of these, after three years, I said, "Gentleman, go! You have done enough." They sit down, and I get ideas. We'd just talk like this, and I'd say, "Oh, let's do this!" It is absolutely fascinating to have students like that. Well, I'm very interested to hear this. Let me tell you this, this is a standard joke, in fact. Even after P. P. left from here and went to Cal Tech, if I get an idea, I will call and say: "Let's do this!" In two days he has worked everything out and the whole paper is in my desk. Sometimes, it's unbelievable. I'll say, "How come I didn't think of it?" And in a text, he brings things -- based on the three or four people worked, but in totally different directions -- and we come up with the most general theory. Because, again, I don't do circuit theory; how do I derive its result? Then we found a lot broader solution. This is a fascinating story: there's a class of transfer functions you can realize as a parallel allpass. We came up with a general theory. Fettweis' student came from the circuits, and then showed this parallel allpass using the Fettweis' concept in one particular case. Bede Liu and Rashid Ansari came up with an answer to the problem of: here's a parallel allpass; can I optimize to get it? They came up with the same solution, but by a different way. There are several cases of this. For example, this gives you two filters which have power-complementary property. In using your speaker, you have a low-pass, and a high-pass filter. Sometimes you even have three filters. They have to match up in property. Usually they are designed separately. Using this approach, we can design one structure which will guarantee always the power-complementary property even if the components change. But it turns out they have a lot of other properties. We showed it can be done for odd-order, low-pass, high-pass complementary filters. I was positive there must be a way to do even order. Phil Regalia at that time was doing a senior project with me. When I teach my upper-division course, I encourage them to do a senior project, mainly to see who's a good student and might do a Ph.D. with me. Phil was interested in active filters, and I had a professor from Japan visiting who needed somebody to build a circuit. I said, "Phil, why don't you build this filter for him?" He came up with a totally neat way of tuning the filter, the tuning algorithm, and we published a paper. He said, "Dr. Mitra, what else can I do?" I said, "Phil, why don't you look at this problem? We have solved the odd order, in the solution -- here is my idea, maybe." And a week later, he said, "Dr. Mitra, I can do a second order Butterworth. But I need a complex allpass." And I looked and I said, "Phil, you have solved the complete problem." It was obvious, because we were thinking of real allpass, and the complex allpass was the solution! So I called P. P. and said, "We've solved it!" A few days later, he had the whole paper written and worked out. Is this typical of the way you operate? Do you continue to work with students? I used to, but finally my students said, "Dr. Mitra, you're not giving us a chance, because he wrote so many papers after he left." Mainly I'd call them up and phone -- because I have to talk, if I get an idea, I have to talk to somebody, see how it works. P.P. I enjoyed that with, and plus, he picks up things so fast, more than anybody else I worked with. Phil Regalia was another one like that. So unfortunately I don't talk to him as much as I'd like to, because my students feel threatened. Because my interests have changed, more image processing. This is typical. I will go to a conference and talk to someone and come up with a lot of work. In the past, I have worked with Brian Anderson. I had some ideas which I'd discuss with people, and no one was interested until Brian came here on a sabbatical. I was instrumental in bringing him. He's another giant in the field, and he is sure sharp. In six months we wrote six papers. I mean, he would pick up so fast what I was trying to say. It was very important to have that kind of complementary property, people who understand. I also have a lot of collaboration with Dr. Neuvo in Finland, who is no longer at the university, but is now the vice-president of Nokia Mobile Phones. He decided to quit and make money. We wrote probably sixty, seventy papers. It sounds almost like you're the idea person and then you call someone and then they do all of the careful write-up. Right. Basically, when I get an idea, I tell someone, they do it, and I evaluate it. And that's the way I have been. But Neuvo and I have collaborated a lot; my students go there, and his students have come and spent time. We have a long-term collaboration. In fact, just about a month ago, finally, one of our early work a company is using, this is one of our papers. I was going to ask, what are the areas of application of all of this filter theory? Well, if you'd read my book, this first chapter, if you have time to read it, gives a very good idea of where signal processing is going, and it took me a long time to write, a lot of applications. It took me eight years, but shows some examples, why those are signal processing. There's no equation. Good. And this is, for the record, the Handbook for Digital Signal Processing, by Mitra and Kaiser. And this did very well. I got talked into doing this handbook, and it was more work than I had anticipated. But that I am positive will give you an idea. Sometimes these handbooks are extremely important in an area of engineering. Has that been true in areas you've worked in? Well, when we started, it was long before there was a handbook. Jim Kaiser and I, we met in Denver, at ICASSP, and over dinner I guess we decided to do the handbook. Then I became department chair and I had no time, and I dropped everything. Literally. Because I felt my commitment was to the department. And it was two years after I had come here, so I felt honored that I had been asked to become chair of the department, and the department was evolving. I had lots of ideas to implement, and I had a bet with the previous chair that this department would go to the top twenty in five years. I was joking, but we did it. When I stepped down, we were ranked eighteenth. And our department was ranked the most improved department, literally, in the whole country. This was in a National Academy of Sciences survey. What I was thinking of was that I know, some time ago, certainly a hundred years ago, for German professors, it wasn't so much -- the highest product of their work wasn't the paper and the Annalen. The handbook chapter was the synthesis of their work. Well, this handbook was primarily for professional engineers, for students. We decided not to tell everything, but to talk about what we thought was most important. So each author was told, "Don't try to make a survey, and pick what you think is useful and important." We had a lot of iterations, going over the outline. I wrote a manual on how to write chapters so the chapters all looked alike. Unfortunately a lot of authors didn't follow it, so I had to redo it, and I have a cabinet full with my revised comments. It took a lot more time than I had anticipated, physically. But, anyway, it has become a good seller. The McGraw-Hill Book Club picked it up as a primary selection. It got several good reviews, including a statistics journal. I met someone in statistics, and he said, "Oh, your book has been reviewed." He sent me a copy, and one of the comments there was, "It's not my field, but I could follow it." So that was our objective, to try to bring it to a level where you don't require a lot of sophistication. Again, because I'd been in DSP for a long time, I was looking to do different things. And the department chair at that time, I think it was 1982, asked me to teach robotics. We wanted a robotics program. So I taught one quarter, and said I hated it; I didn't like it. Then the department said, "Well, would you like to teach image processing?" I said, "Yes, I'll give it a try." And one condition was that I get a lab. So we had a modest lab, but eventually we got a very good lab. And with image processing, the one thing I liked, you see what's happening. What sort of image processing did you do? I did everything, not just one. Started with image enhancement, partially due to Jim Kaiser's work, but before that, I had tried some of the DSP work in image processing. I read a paper and thought, "This sounds familiar; oh, I've seen this in DSP. Can I try this?" It sounds like a number of times you've transferred knowledge to a slightly different realm. But I think now we are spending more time on nonlinear quadratic filters. There's another group in Italy which started on it, and we have decided to collaborate. One of their professors came here last November to write a joint paper with us. So what we have done will be in a paper. A lot of them are short-term. But basically, on my first sabbatical I went to India. That was long, and I found that my students suffered, because at Davis, I was the only professor they could work with. In fact, I lost a very good student who did a master’s with me. He did a piece of beautiful work in one year, and then he went to another professor because I was gone for a year. So after that, I took short trips. I find them very useful. Vienna was very recent; a professor from there had come here on sabbatical a year before, and had spent six months. I'd started the undergraduate text on digital signal processing, but had to drop it because of the handbook. So after the handbook was out, I again decided to go back to see. When Mecklenbräuker was here -- he used to be at Phillips for a long time, before he went to Vienna -- I said, "Why don't you look at my notes and tell me, because I want to write a book." He said, "No, no, there are too many books." I said, "Read. If after that you say it was not worth it, I will drop the project." But he liked what I was doing. He made lots of good comments, and really helped me. After he went back, he said, "Sanjit, I promise you money for a month, will you come." I primarily worked on my book, and I gave a couple of lectures. That was a good break, and he helped me a lot. At Croatia, there is a professor whose connection to me goes back a long time. He came on a sabbatical to Davis, and we became very good friends. So have these trips often been to work with a particular person? Yes. Particularly. The professor from Croatia, he comes almost every year to work with me here. Then one year, he managed to get me a Fulbright for a month. Most of these trips are about one month; that's about the maximum I can take now. Do you collaborate to an unusual degree? It sounds like it to me, in working with people? I have lot of collaboration. In fact, as you see, I get a lot of visitors, and many of them come and do their thesis work here, and submit it at their university. I had two students like that from Norway. And lately I'm getting a lot of Germans to come do their bachelors project, a diploma project. One of them I have to get started on his Ph.D. thesis, and that's in collaboration with a German professor. And it sounds like there's a quite good international exchange in this area. I think so. I like working with people. People have to be excited about a problem I am excited. And so I will work with anyone who feels what I am thinking is worth doing. (Telephone rings) That was Papoulis, and I invited him. I didn't realize he was spending this quarter at Irvine, so I invited him to come and spend a day. He is at the Polytechnic University of New York, a very fascinating person. Fortunately a Japanese friend got his university to nominate me for the Japan Society for the Promotion of Science, and that offer came. Within a week I had an offer from Germany, but I had accepted the Japan offer, because I couldn't wait. I spent four months there and wrote four papers. It was fascinating. And then we started collaborating. I used to go to Japan almost once a year. This friend in Kobe became a very close personal friend. Again, we think the same way. With collaboration it is very important to think the same way. Most researchers are pretty biased, you know, and sometimes I have suffered because I have gone in the wrong direction. Later I realized that I was a mistake. How about e-mail for collaboration? Have you made much use of that? Not for research, except now all my collaborators have an account here. So they can print, and then I read, comment, and we send them back, particularly the images. Mostly this is sending whole files, text. Every one has an account in my lab. But not exchanging comments by e-mail? We do that also. I have a lot of professional activities. I find e-mail extremely helpful, because in a few minutes we can exchange ideas. I also wanted to bring that up, that you have been very active in professional activities. I have been I think too active, and I should cut it down. In organizing sessions and conferences. I don't do that too often, I have been lately involved in too many things... This idea came to me when I was president of the Circuit Systems Society, and I said, "What is IEEE doing?" This was a general lecture, what I thought IEEE should be doing. I thought, mainly, we publish journals and we hold conferences. I said, "We should go beyond that." One thing is, we should tell the young people what new areas to get in. Otherwise, when everyone writes a proposal, their Ph.D. thesis, they are extending what I call delta improvement. And they have to know which areas to get in. We have to tell them what the problems are. I think a lot of research problems now are beyond one person's scope, and really require international effort to solve. So you think that the Circuits and Systems Society, for example, should take the lead in identifying some new areas? I talked to a number of friends of mine about how we should have a workshop on future directions. And I talked to someone I know with the National Science Foundation, a friend, and he said, "Oh, great idea; write a proposal." I said, "I don't have time to write a proposal!" He said, "I will help you." So by the time I got some time, he said, "I am no longer at NSF." I said, "All right." A few years later, Ming Liou was president of Circuits and Systems, and he created a committee called Strategic Planning, and asked Ernie Kuh to chair that committee -- my former advisor. Ernie knew about my ideas, so Ernie called me and said, "Sanjit, you want the workshop, do it." So we started meeting, forming a committee. It was partly successful, but I think one of the problems is circuits so broad, trying to cover everything. I would have picked hot areas. So last October I organized a workshop in Switzerland, in future directions in mixed analog and also signal processing. This was much more focused. Nobody's auspices. I raised money privately, and talked to companies to donate money, mainly to help academics from the university. Then my friends in Europe got money from the European commission for this, and got a granting agency, the EC. It was small scale. And that's something I would like to do every other year. It was reasonably successful, but I picked the wrong time. So we missed some good people. I didn't realize the timing factor when we did it, because it conflicted with the low-power workshop on the same date. A lot of people in low-power also are interested in mixed analog. So, if we do it next time, I'll do some research and make sure there's no conflict. We have money to support people, and a lot of companies want this; if I talk to them, they'll fund it. I'm particularly interested in your IEEE experiences. What about your experience with CSS and especially as its president? Has that society functioned well, do you think? Well, the Circuit Systems Society, as you know, is one of the oldest societies, number four. We have spawned a lot of other societies. If you go to the early Transactions, you see control papers, computer papers -- I would like to see IEEE totally reorganized, because it's now too many societies, and a lot of overlap. It is not helping. If I have to join, I should belong to half of the societies with my present interests. So I cannot afford it. The other problem I find with IEEE is that, because there too many societies, everyone wants to have a journal, everyone wants to have a Transactions, and they're not cost-effective. The problem with this approach is that, if an area is dying, you know, the journal will still keep going on. I would like to see a few major divisions, and journals with multiple divisions sponsoring, so we can get to the new area fast, without worrying who it should belong to. The dead areas we can get rid of fast. It would be a lot more flexible. I don't know whether it can be done. Maybe the Transactions organized at the division level rather than at the society level. Right. With multiple parents, so nobody feels obligated to keep a Transactions alive. But the main thing is to get into new areas very fast. And that's a problem now, because there's not a Transactions for that area? It takes time, because sometimes you need to get approval, or a society will say, "Oh, it belongs to us." Everyone wants a piece of the action of the hot areas. But it's a lot more difficult, whereas SPIE, and I decided to belong -- I find they get into new areas faster; they have a conference and a topic which is emerging before anyone is thinking about it. So I finally said, "Let me become a member, and then I will know what's going on." Some how they are organize in such a way: they define an area and organize a conference. They don't have journals. But even organizing a conference in IEEE in a new area is very difficult. Some society has to sponsor it, unless IEEE creates a Society for Emerging Technology or something. We have to. It's getting too focused, and there's too much overlap going. Even education I think we have to change. Well, computer science is separate from electrical engineering, and that's not good. I'd like to see a flexible program. We have instituted one program here, by the way, which was my idea. It came out of this workshop we organized. We got money from the National Science Foundation, the education directorate, and Ernie said that everybody must have one transparency on education. I had probably ten or fifteen, and when I sat down, I said, "We are not doing things right. The system has become very involved, and in whatever time I have I'm trying to talk to people, getting ideas, saying that we need to change the curriculum." Some universities have done it already, Carnegie-Mellon, MIT, but I really want to make some fundamental changes. It should be a very flexible program. Basically, the students who are graduating should be specialists in many areas, because most companies are downsizing. I had lunch with Tektronix today. They're coming to recruit. The company used to have twenty-five thousand people, five or six years ago. They have seventy-five hundred now. They're making more money and more products, and they're looking for people who know many things. So we have to start training people that way. Because of the traditions of the academy, it's very difficult; students think, "Oh, I must take this." And what we have instituted, which I proposed at the workshop, is a five-year joint masters and bachelors program. The student gets two degrees at the end of five years. And we encourage the students to take any combination of courses from any department. Come and sit down with us and say, "This is my job objective." Most likely we will approve. They still have to fulfill our requirements, but after that they can take anything. Business courses - we'll approve. Okay. So it might be that there are two problems. One is that the educational structure is behind the times. Because of the structure. With departments and everything, it makes it a lot more difficult to change. IEEE also should be restructured so that we can change with the directions. I think they are too structured right now. The Computer Society and the Control Society, which deal with a lot of my interests; I get ideas listening to those things. We are not mixing, benefiting. And it's very important that we learn what the problems of a society in other areas are. We can help. There are, of course, the big conferences, like WESCON and ELECTRO and so forth, that are supposed to bring together many technical areas. I don't know; I would like to see some way of providing a mechanism and make it exciting enough so that people go and present papers and are willing to listen to somebody else. And that mechanism is not happening. Maybe there's another solution, but the solution I have in mind is basically to decouple conferences and publications from the society, or the division level. Then we would have journals, conferences, with many parents who are jointly responsible. Eventually they become another society. Then we don't have that overlap. Things change so fast that ten years from now, in one area, you know, there's practically nobody interested. Is the present divisional structure reasonably satisfactory? I haven't looked at it, actually, but I think it might not be a bad idea. Some of the things you've named are, of course, in different divisions. But I don't belong to a division. I belong to a society. Right, you belong to societies. But if all of the societies you were interested in were in division three, then it would be solved. But then I'd have to be a division member rather than a society member. My loyalty is to a bigger organization. I want this journal. But I don't want to pay four hundred dollars in dues to get all the Transactions. It's not just getting Transactions. If you are not getting members, you are not getting subscriptions; they're out. What about some other areas of IEEE action in standards and continuing education. Have they been important in your area? Well, I hope I have some role in continuing education. I used to belong to the San Francisco section of IEEE because Sacramento was mostly power. I switched my membership and was a very active member of the Circuit Theory chapter at that time, which became Circuits and Systems. Then I was asked to become the chairman. The Circuit Theory chapter in those days had over a thousand members in the Bay area. At our monthly meetings, twenty-five or thirty people show up. So I started thinking, why we are not getting more people to come,” very unscientific analysis. I said, "Who is coming to give a talk?" I gave a talk before I was a member. Essentially I'd pick up a paper I've written. Most people in my area already know my work, so why should they come? I got the idea of having a one-day course on a Saturday, a very low-level one, so I prepared a questionnaire asking if people would be interested in a very low-cost, one-day course on a Saturday. I picked some topics. There was enormous response. We wanted to charge a fee, just to cover expenses. Jim Mulligan was the president. He was in Washington. I went to Washington, and I said, "Jim, here's my idea. Can I do it? Or will there be some IEEE rules and regulations?" Jim said, "Sanjit, do it. Don't ask. If you ask, you'll find twenty people saying, 'Oh, you have to talk to me.' You can always say you did not know." I said, "What happens if we fail? Will you back me up?" And he said, "Sure." I took his word for it. We put together a course on analog integrated circuits. The vice-chair was Al Grebene; he was in that area. I talked to the local printer in Davis, said "I'll pay you once we get our money," He said, "Okay." So he printed nice brochures, flyers which we distributed. And when the response came in, we had about three hundred or three hundred and fifty people who wanted to attend. We used to have a classroom in Stanford for our monthly meeting. Panic set in, and the people at the Stanford Linear Accelerator Center said we could use their auditorium and they'd supply the projectionists because they had very sophisticated machines. So we made a deal that six of their employees could take the class free. It was ten dollars a person, including lunch, and Xerox costs. You didn't spend too much time, and it was a very low-cost affair -- minimal effort. We made money. It was all volunteer work; we prepared sandwiches. Then after that, we started paying people, by volume. They were very happy. We felt we were filling a niche. It's not a university trying to make money, or an extensive three-to-five-day course. Very low-level, so people had a set of notes and references, and volunteers came. You know, Wilder, the fellow who invented the op-amp, he came. Gave a talk. We had no problem finding people. Most of them we never paid. For some of them we started paying expenses. It was very successful. I felt IEEE should do it, so I wrote to Glen Wade who was the Director of Education Activities Board. I said, "It has been very successful here, and maybe IEEE should also think about this. Not to make money, just to make enough to break even." So Glen invited me to be a consultant to EAB, and I started a program. The first few courses I organized with INTERCON in New York, and then I said, "Look, you should have full-time people." But it was to get that to that stage. I still think we should do this kind of low-cost thing. It hasn't happened very much? No, a lot of the things they have been doing are pretty expensive. The videotape thing -- I'm not sure there will be too many takers. But I think we should go beyond this in education; that is something which we should be involved with. So I can take credit for at least getting it started. Well, I don't want to take too much more of your time. Are there any things you'd like to comment on? I don't know. I enjoy what I do. I really enjoy it. I think this is a fascinating thing. Particularly, as a university professor -- there is both the good and bad. The good thing is, I can change things, I can do new work, in new areas. Having good students is difficult to place a value on. It sounds like you are very much aware of what industry needs these days. Basically, I try to. I go to industry, talk to people, to see what the curriculum needs, plus my research needs. I have changed fields, and I need to be in an area where there is a demand. One of the things I do believe, is that whoever students I am graduating, they should get jobs. I don't want to produce Ph.D.'s in an area which is dead. A long time back, I decided there were too many circuit theorists, so I got out at the right time. DSP is, again, getting saturated, but there is still demand, particularly in industry. I think image processing is one of the areas which is going to grow; I am into video processing. If we're done, I'll show you some of the work we do. This page was last edited on 1 February 2019, at 19:17.